Notes: Knight of the Garter. E. Pembroke. Uncle of King Henry VII of England and the architect of his successful conquest of England and Wales in 1485. Jasper was the third son of Owen Tudor and the former queen Catherine of Valois, widow of King Henry V. Hence he was a half-brother to King Henry VI, who, on attaining his majority, created Jasper Earl of Pembroke. His brother Edmund was made the Earl of Richmond. 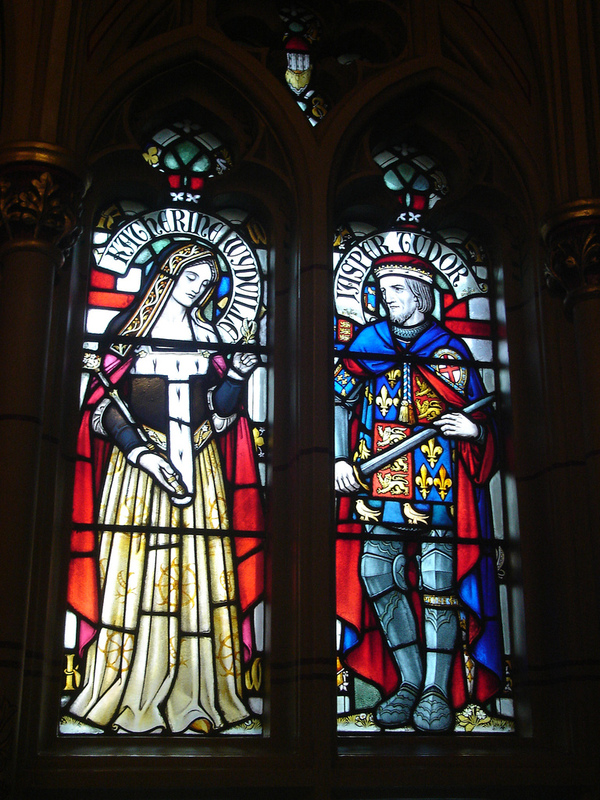 The following year the brothers were given joint custody of the rich heiress Margaret Beaufort, and in 1455 Edmund married her. Jasper was an adventurer whose military expertise, some of it gained in the early stages of the Wars of the Roses, was considerable. Although there was uncertainty as to whether Jasper and his two (or three) brothers were legitimate, their parents' probably secret marriage not being recognised by the authorities, he enjoyed all the privileges appropriate to his birth until 1461, when he was subject to an attainder for supporting King Henry VI against the Yorkists who eventually deposed him. Jasper fought in Henry VI’s army at the Battle of St. Albans in May 1455, where the royal army was beaten and Henry himself captured. Jasper survived the battle and attempted to reconcile the warring factions. He was briefly successful as the rebel lords renewed their oaths of allegiance to King Henry, but fighting soon broke out again. In 1456 his brother Edmund Tudor was captured by the Yorkists and died of an illness contracted in prison, leaving his young widow with an unborn child. War resumed in 1459 when the Duke of York returned from exile in Ireland. Jasper was ordered to seize Denbigh Castle to block York’s lines of communication between England and Ireland, which he did successfully. Disaster struck when the Yorkists met and defeated King Henry’s forces at Northampton in Jul 1460. Jasper was left isolated at Denbigh but refused to surrender. A Yorkist army stormed Denbigh but Jasper managed to escape and join up with Lancastrians in Wales. He remained in touch with Margaret of Anjou, queen of Henry VI, as she struggled to regain her son's Edward inheritance. The fortunes of war now swung in Lancaster’s favour as the Duke of York was ambushed and killed by Lancastrian forces at Wakefield and his army wiped out. The Lancastrians then marched south and defeated another Yorkist army at St. Albans while Jasper Tudor helped to gather an army in Wales. In early 1461 the Welsh force, which included Jasper’s father, Owen Tudor, marched to the borders of Herefordshire to face an army led by the Duke of York’s son Edward. The ensuing battle at Mortimer’s Cross was noted for the appearance of three suns in the sky. Jasper’s army was defeated and in memory of their victory the Yorkists adopted the image of the sun as a symbol. Jasper escaped but sadly his father was captured and executed in the market place at Hereford. His last words were ‘This head shall lie on the block that once lay in Queen Catherine’s lap’. Soon after Mortimer’s Cross the main Lancastrian army was exterminated in a colossal battle at Towton in Yorkshire. Edward marched to London and was crowned King Edward IV, while Jasper fled to Ireland and spent the next few years living as a hunted fugitive. He reappeared in 1468, landing in North Wales to try and relieve Harlech Castle (the valiant defence of the garrison was the inspiration for the song ‘Men of Harlech’). Jasper was attainted, and William, Lord Herbert, created Earl of Pembroke in his room, his patent expressing, that he had that honour for expelling Jasper the rebel. The custody of Jasper’s nephew, Henry Tudor was taken over by William Herbert. Jasper was involved in another Lancastrian invasion in 1470, and this one was more successful as Edward IV’s soldiers deserted him and he was forced to flee abroad. Henry VI was brought out of imprisonment and restored as King. Jasper was restored to the earldom of Pembroke, but the mental health of Henry VI, he had always been weak, now completely failed. He did have one moment of prophetic lucidity, for when Jasper brought his young nephew Henry Tudor to court King Henry declared that the boy would one day rule England. It was thanks to him that Henry acquired the tactical awareness that made it possible to defeat the far more experienced Richard III at the Battle of Bosworth. On Henry's accession in 1485, Jasper was restored to all his former titles, including Knight of the Garter. He was also made high steward at the coronation of Queen, Elizabeth. The next year he made him lieutenant of Ireland for one year. He was created Duke of Bedford and married the former Catherine Woodville, sister of Queen Elizabeth Woodville and widow of the Duke of Buckingham. In 1486, he helped suppress the Lovel/Stafford revolt near York. In 1488, he took possession of Cardiff Castle. In 1487, he fought at the Battle of Stoke. In 1492, he fought in France and was made Earl Marshal, office granted to him and to the heirs male of his body. He died in Dec 1495, and was buried at Keynsham Abbey in Somerset, where he had founded a chantry for four priests, to sing mass for his father, Catherine his mother, and Edmund his elder brother.